Whilst the rolling Greek tragedy that is the Labor Party continues, the price of utilities continues to take away the spare cash of many Australian families. The Labor Party went to the election saying that they would ease the squeeze and assist with the cost of living but this is another promise which they have never delivered. In fact they were increasing the debt and increasing pressure on interest rates while they made life harder not easier for people. Australians are quickly coming to the conclusion that life under Labor is an erratic roller coaster which the wheels will fly off at any moment. Electricity prices are going up 9.3% a year under Labor. They went up 0.5% a year under the Coalition. Water prices are going up 7.6% a year under Labor. They went up 1.2% a year under the Coalition. Gas prices are going up 6.5% a year under Labor. They went up 1.3% a year under the Coalition. Overall, utility prices are going up 8.2% a year under Labor. They went up 0.8% a year under the Coalition. Australia can’t afford another three years of Labor. Federal Treasurer Wayne Swan has conceded the Opposition is correct when it claims Labor is borrowing $100 million a day to pay back Government debt. Of course, it takes only a few seconds to keep tabs on Labor’s borrowings. Just visit the Australian Office of Financial Management (“AOFM”) website to see the current total borrowings – listed as $150.533 million presently. Don’t forget to add to this total, the amount listed at each link under the “Recent Tender Results” title, on the right hand side of the page. These are the extra amounts borrowed last week, but not yet added to the total. So that’s another $1,800 million in the past week, giving us a grand total of $152.133 million borrowed up till last weekend. Then, to see how much the Government plans to borrow in the next week, click on the “Forthcoming tenders” link, also on the right hand side of the AOFM home page. As you can see, on Thursday and Friday this week, the Labor Government will borrow a total of another $1,000 million. Is it Christmas? Seriously … is it Christmas?! Not only is Liar And Incompetent of The Millennia, former PM Kevin Rudd, now confined to the dustbin of ignominious history. Finance Minister Lindsay Tanner has announced he will not be contesting his seat at the next federal election. Mr Tanner made the announcement to parliament this afternoon, saying his decision was unconnected to the Labor leadership change. “I want to assure the house that this decision is … totally unconnected to the events of the past 24 hours,” Mr Tanner said. One of the primary motivations for launching this blog, was your author’s outrage at the blatant lies and vicious, underhanded misrepresentations by soon-to-be former Finance Minister Lindsay Tanner, and his singular role in feeding the media with lie after lie after lie, all aimed at vilifying the then-new (now former) Shadow Finance Minister, Senator Barnaby Joyce. As regular readers will know, your author has written many columns and analyses, using the official Government Budget documents, showing the countless lies and misrepresentations of truth by Tanner. In fact, much of this blog has been devoted to exposing his lies and deceit. While we joyously await his departure from Parliament, enjoy catching up on all these lies and misrepresentations made by Tanner in recent times. Just click on any of the links to your right, under the main title “Pages“, and sub-heading “Resources & Articles“. You’ve seen off the ETS. And Kevin Rudd. Now, your arch-enemy Lindsay Tanner is gawn too. And you’re still here for us. Well done champ! Questioning in Senate Estimates today showed that the Labor Party has been cooking the books to make their spending plans look better. In the budget the Labor Party brought forward about $1.5 billion, which was earmarked for spending in future years for State and Local Governments, to this financial year. “Much of this will be paid on June 7. It is not clear what State and Local governments will do with the money for the 23 days that will be left in this financial year. Perhaps the interest will help their bottom line at the expense of the Commonwealth’s”, Senator Barnaby Joyce said. This government is constantly ‘cooking the books’. Goldman Sachs’ Australian subsidiary, JBWere, has issued a note to clients highlighting the reasons for the ongoing rout in the Australian Dollar, which has nose-dived from USD93c to just USD81c (at time of writing) in just three weeks since April 30. Despite our belief that relative growth and relative interest rates suggest some support for the A$ over coming months, it is hard to see a swift resolution to the major sources of risk aversion impacting Australia and its hard to build a compelling case for offshore investors to bid the A$ higher. In that environment it will be difficult for our long-standing 95c target for the A$ around mid-year to be met; however, we still think our 12 month 90c target is still feasible, albeit with the path to 90 now likely to be via near-term weakness. Whether an ongoing decline in the A$ is in prospect will partly hinge on whether the Treasury Secretary’s suggestions that the WACC for the resource sector will be lower are viewed by the market as valid arguments or not. 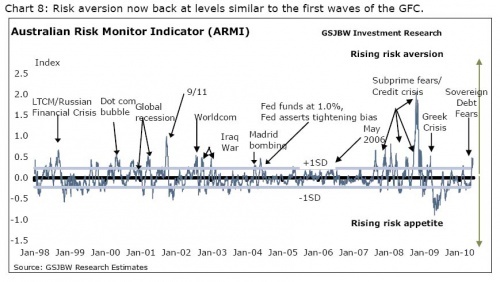 In sum, it is not just risk aversion that is driving the A% lower at present, fundamental factors have also been very important (relative growth, shifting rate expectations, lower commodity prices and capital exit) and the path to lower risk aversion is less dependant on the typical ebb and flow of market sentiment and highly dependant upon the actions of policy makers in Australia and Europe. Our A$ forecasts are now under review. So there you have it, from one of the world’s most powerful investment banks, in their advice to clients. “Fundamental factors” have been “very important” in the rapid sell-off of the Australian Dollar. And a key factor blamed, is the Rudd government’s “Resource Super-Profits Tax” (RSPT), inspired by Treasury Secretary Ken Henry. The financial markets are now considering the AUD to be a high risk currency. And according to JBWere, the “path to lower risk aversion” is “highly dependant on the actions of policy makers in Australia…”. Rudd’s proposed “super tax” on the mining industry is not just wiping tens of billions off the value of Australian mining company shares – and the value of your Superannuation account. It has also pulled the floor out from under the Aussie Dollar. Insulation program. School halls. Border protection. Computers in schools. Renewable energy. FuelWatch. GroceryWatch. “The greatest moral challenge of our time”. Does everything this government does turn to $***? The annual debate about the budget gets ever more unreal. This year it reached the height of absurdity. Budgets used to be about what the government plans to do in the coming financial year. Now they’re about what supposedly will happen any time over the next four years. How unreal can you get? Who on earth knows what will happen over the next four years? No one. Certainly not Treasury (nor any of the smarties who think they know better than it). This time last year Treasury’s best guess was that unemployment would peak at 8.5 per cent next year; now we know it peaked at 5.8 per cent in the middle of last year. This time last year we were told revenue collections over five years would be down $210 billion on what the ”forward estimates” had told us the year before. Now we’re told they’ll be down $110 billion – but why would you set much store by that guess? We know from repeated experience that Treasury is quite bad at telling us in early May what the budget balance will be at the end of the following month. And yet we take seriously what it says the balance will be in three or four years’ time. This year there’s been huge emphasis – encouraged by the government’s rhetoric and amplified by the media (including yours truly) – on one figure: the projected budget balance in three years’ time, a surplus of $1 billion. Hallelujah! Home and hosed. All over bar the shouting. How absurd can you get? Treasury isn’t even prepared to dignify this figure with the status of a ”forecast”? It’s the product of a completely mechanical, punch-in-predetermined-numbers ”projection”. Here’s another absurdity: the public debate about the budget treats all its figures as if they were accomplished facts. No ifs or buts or maybes. And do the purse-string ministers – who know better than anyone how unreliable these figures are – make it their responsibility to warn us not to take them too literally? Not a bit of it. Here’s Lindsay Tanner: ”The result is that we are back in surplus three years ahead of schedule in three years’ time and the level of debt Australia has will be half of what was initially projected” (my emphasis). Last year’s projection was rubbish, but this year’s is fact. Of all the (inescapably) rubbery figures in the budget, the one we’ve fixated on is the rubberiest: the $1 billion cash surplus in 2012-13. The one thing you can bet on is that the budget balance that year won’t be a surplus of $1 billion. This relatively recent shift from focusing on the budget year to taking a blurry look at the next four years has made it easier for governments to manipulate our perceptions of the budget. And boy, weren’t the pollies working hard at it this year. Read the rest of Gittins’ detailed and brilliant critique here.